Passively transmits real-time video over a single unshielded twisted pair (UTP) of CAT5/5e/6 cable up to 1312ft away. Compatible with PAL, NTSC, and SECAM. Transmission signal: 1Vp-p composite video. 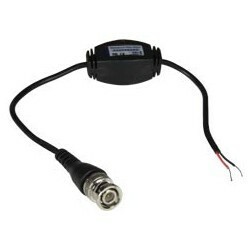 75 ohm male BNC video connector with 26AWG 2-wire lead. Built-in PCB with interference rejection.